Sen. Joe Lieberman, the Democratic vice presidential pick eight years ago, appeared at the Republican National Convention on Tuesday and criticized his former party's nominee Barack Obama as an untested candidate unwilling to challenge powerful interest groups as both Republican John McCain and one-time Democratic President Clinton have done. "Sen. Barack Obama is a gifted and eloquent young man who I think can do great things for our country in the years ahead," Lieberman said. "But my friends, eloquence is no substitute for a record - not in these tough times." The convention hall resounded with boos when Lieberman said the Democratic presidential candidate voted to cut off funding "for our troops on the ground" in Iraq last year. Playing his former party's spoiler, the Democrat-turned-Independent called McCain - not Democratic nominee Obama - the best choice to lead the country forward. "What, after all, is a Democrat like me doing at a Republican convention like this?" Lieberman asked the cheering crowd. "Well, I'll tell you what, I'm here to support John McCain because country matters more than party. 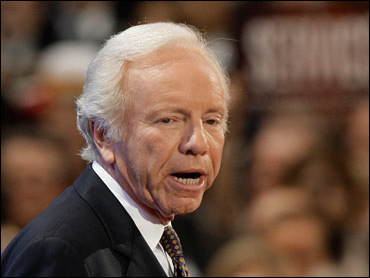 "John McCain is the best choice to bring our country together and lead America forward," Lieberman added. Appearing from the White House via satellite earlier in the night, President Bush hailed McCain as a man "ready to lead this nation," a courageous candidate who risked his White House ambitions to support an unpopular Iraq war. Mr. Bush reprised the national security themes that propelled him to a second term as he spoke. "We need a president who understands the lessons of Sept. 11, 2001," he said. "That to protect America, we must stay on the offense, stop attacks before they happen and not wait to be hit again. The man we need is John McCain." "No matter what the issue, this man is honest and speaks straight from the heart," Mr. Bush said. "The message of the day was designed to be about defining and re-introducing the candidate but the attention was focused on who was not in St. Paul - or at least not very visibly," said CBSNews.com senior political editor Vaughn Ververs. "Since being unveiled as perhaps the biggest political surprise in recent history last Friday, Republicans - especially the party activists gathered here at the Xcel Center - have been chattering about Sarah Palin and little else. And the news media is not far behind in the curiosity category." CBS News reports that Palin and former New York City mayor Rudy Giuliani will speak at the convention on Wednesday night during the 10-11 p.m. EDT hour. Inside the convention hall, former Tennessee Sen. Fred Thompson delivered a strong defense of Palin. Thompson said the Alaska governor, was "from a small town, with small town values, but apparently that's not good enough for some of the folks who are out there now attacking her and her family." He said McCain's decision to place her on the ticket "has the other side and their friends in the media in a state of panic." Thompson also took aim at the Democratic nominee Obama. "Democrats present a history-making nominee for president. History making in that he is the most liberal, most inexperienced nominee ever to run for president," Thompson said as delegates roared their agreement. Thompson jabbed at Obama on abortion, as well. "We need a president who doesn't think that the protection of the unborn or a newly born baby is above his pay grade," he said in prepared remarks, referring to a recent episode in which McCain's White House rival said it was "above my pay grade" to decide the point at which an unborn child is entitled to rights. Other Republicans - delegates and luminaries alike - defended Palin, who disclosed on Monday that her 17-year-old unmarried daughter is pregnant. In addition, a lawyer has been hired to represent the governorin an ethics-related controversy back home in Alaska. "I haven't seen anything that comes out about her that in any way troubles me or shakes my confidence in her," said former Arkansas Gov. Mike Huckabee, who ran unsuccessfully for the party's presidential nomination this year. "All it has done for me is say she is a human person with a real family," Huckabee said. "The reports I'm getting back is that every time they show that footage we get 1,000 precinct walkers from the NRA," he told members of his state's delegation, to laughter. "She cuts taxes and shoots moose. That's Gov. Palin," Nehring said. Despite Thompson's remarks - and McCain's declaration that he was satisfied with the scrutiny his aides had given Palin before his selection - there were fresh disclosures. Among them: that both as mayor of Wasilla, Alaska, and as governor, she had sought earmarks for local projects. Her most recent round of requests totaled $300 for every Alaskan. McCain has frequently vowed to veto any earmark legislation, and has said she will be a force in his battle to wipe them out. Additionally, the lawyer hired to defend Palin in an ethics investigation said he also is representing her personally and is permitted to bill the state up to $95,000 for work in the current case. The issue involves the dismissal of public safety commissioner Walt Monegan after he refused to fire a state trooper who had divorced the governor's sister. Republicans handed Lieberman the prime spot in the evening lineup, and he was set to blend praise for McCain with criticism of Obama. "When others wanted to retreat in defeat from the field of battle, when Barack Obama was voting to cut off funding for our troops on the ground, John McCain had the courage to stand against the tide of public opinion," the Connecticut Democratic-turned-independent senator said in excerpts released in advance of his speech. Mr. Bush, with his approval ratings in the 30-percent range, was relegated to a relatively minor role at the convention of a party that has twice nominated him to the White House. The president scrapped a planned Monday night speech because of the threat Hurricane Gustav posed to New Orleans. With polls making it clear the nation is ready for a change, the McCain campaign indicated there was no reason for him to make the trip to St. Paul. One day after a frightening Gulf Coast hurricane prompted a subdued opening to the McCain convention, political combat enjoyed a resurgence. McCain's aides disputed a claim that vice presidential running mate Sarah Palin had once been a member of a third party and accused Obama's camp of spreading false information. Obama spokesman Bill Burton said that as far as he'd seen, "the only person talking about her being in the Alaska Independence Party is the head of the Alaska Independence Party." "Their gripe is with those folks," he said of the McCain campaign.